Our 5 step approach to photos you'll adore. Is your pet absolutely part of the family...? Are you looking for an award-winning, professional pet photographer that’s fluent in ‘dog’ to capture the essence of your furkids? Do you have 1000’s of photos of your pet, but none are good enough for your walls? Are you looking for a beautiful lasting momento of them, knowing that your time together will be much shorter than you’d like and that memories fade as time passes? 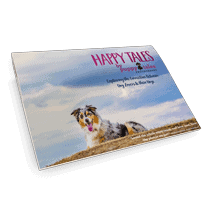 At Puppy Tales Photography we create incredible experiences to capture the connection that you have with your pets & what you love most about them. From this we create a lasting tribute & deliver photography artwork that you can proudly display your home. Looking for an overview of how we can help you? Download our gorgeous online brochure. Have time to stay & dig a little deeper? Why not check out our gallery portfolio to see more of our beautiful photography! My dog doesn’t know how to sit, is that a problem? My dog can’t go off lead, what options do we have? What’s included in a session? Can I be in the photos with my pets? Click here for answers to these questions, and many more! Canberra Session with the whole family! Kerry was wonderful with my family, especially my two girls and their pets. I am amazed by the beautiful moments she has captured and I will treasure them! Sadly, we lost our Jed. He will always be in our hearts and, thanks to you, we have brilliant photos to help us keep those memories alive. Especially for Sam, who feels like he lost his best mate. I really did just want to thank you again, your photos now mean so much more than we ever thought they could. Our photos are up now Kerry and I find myself constantly admiring them! We LOVE them and we loved the whole experience. I won't hesitate in recommending you to anyone that is looking for a pet photographer. We had a session with our 3 dogs and it was the best experience, now we have a fantastic wall to show off with images that will be there forever!